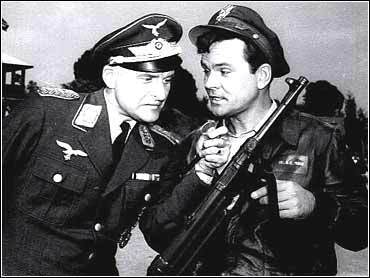 Werner Klemperer, a refugee from Nazi Germany who went on to play the bumbling German prison-camp commandant Col. Klink on TV's Hogan's Heroes, has died. He was 80. Klemperer died of cancer Wednesday at his home in New York, said his publicist, Bernie Ilson. Klemperer, who fled Germany in the 1930s with his father, Otto, a distinguished conductor, won two Emmy Awards for his portrayal of Klink on the 1960s sitcom about World War II Allied prisoners of war. He also received a Tony nomination in 1988 as a feature actor in a musical for his role in Hal Prince's revival of Cabaret. Klemperer's film credits included Death of a Scoundrel, The Goddess, Judgment at Nuremburg, and Ship of Fools. Klemperer also appeared as a narrator with nearly every major symphony orchestra in the United States. His repertoire included such works as Beethoven's Egmont and Fidelio, Stravinsky's L'Historie du Soldat and Oedipus Rex. His narration of Mozart's The Impresario, with the Mostly Mozart Festival Orhcestra, aired on PBS's Live from Lincoln Center. Klemperer's other Broadway roles included starring opposite Jose Ferrer in The Insect Comedy, and with Tallulah Bankhead in the 1955 production of Dear Charles. Most recently, he co-starred in the Circle in the Square's production of Chekhov's Uncle Vanya. He also performed in various operas, including The Sound of Music, with the New York City Opera. He performed the role of Prince Orlofsky in Die Fledermaus, with opera companies in Seattle and Cleveland. But for television sitcom fans, who can still see Hogan's Heroes in syndication, Klemperer will always be remembered as the bumbling, monocled Klink. He was the commandant of a prison camp of Allied soldiers who routinely sneaked out of the compound  sometimes to attack the Nazi war effort and other times for other less patriotic endeavors. He is survived by his wife, actress Kim Hamilton Klemperer; a son, and a daughter. A private funeral will be held and a memorial service will be scheduled at a later date.